The Hindu festival of Chaitra Navaratri is celebrated by observing a vrat or fast for nine days. The celebrations kick starts from the Pratipada (1st day) till the Navami (9th day) of the Shukla Paksha (bright lunar fortnight). It is named Chaitra Navratri, to distinguish it from Sharad Navratri, since it falls in the month of Chaitra, the first month of the Hindu calendar. The nine days of the Chaitra Navratri are devoted to worship of the nine forms of Goddess Shakti through prayers and fasting. Those observing the vrat eat satvik food, free of onion and garlic. On this occasion, certain preparations like vrat ke aloo, chilla, etc. are prepared for those observing the fast. They are lip-smackingly delicious and easy to make. Here are some quick recipes for Navratri. 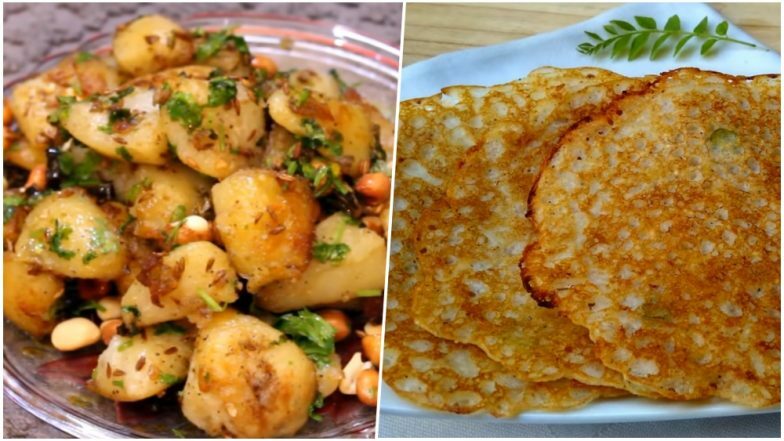 Chaitra Navratri Fasting: Foods to Eat and Avoid When Observing the Fast. This is a healthy and simple Navratri snack made with less oil. Simple ingredients such as boiled potatoes, finely chopped green chilli, grated ginger, roasted and crushed peanuts, coconut, rock salt, pepper powder, sabudana powder, coriander, etc. Easy to make and delicious to eat this Navratri Chilla recipe is exactly what you what this Navratri. A simple and healthy snack that you can also eat if you are fasting, this Chaitra Navratri, this recipe includes very basic ingredients. With simple ingredients such as Sago(sabudana), peanuts, cumin seeds, green chilli, curry leaves, potato, carrots, tomatoes, lemon juice, ghee, coriander leaves, etc you can make the classic Sabudana Khichdi. This delightful aloo recipe is a tangy treat to your taste buds, it can be made under 5 minutes and can also satiate your hunger as it is filling. Traditional dip or chutney is Indias most favourite thing to eat. Chutneys can make anything tastier and especially on the day when you are fasting, you need something to tingle your taste buds. Here it is. According to the Hindu Puranas and writings, Chaitra Navratri was the most relevant Navratri in which people worshipped Goddess Shakti, till Lord Rama prayed Goddess Durga in the month of ' Ashwin" during the Ramayana battle. Chaitra Navratri is celebrated with tremendous energy across India, chiefly in the Northern States.